It is a beautiful sunny day on the Gulf Coast of Florida—perfect for a Jet Ski excursion to Dog Bone Island with a pack of buddies who live in the seaside suburb of Barkington Bluffs. 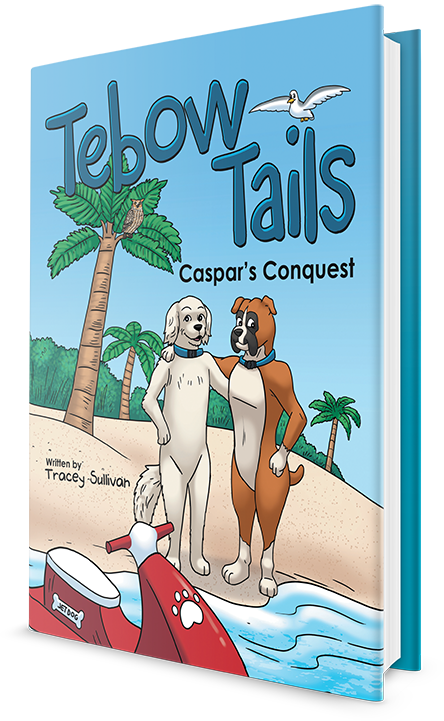 Tebow, a boxer, is outgoing, while his best friend Caspar, a golden retriever, is bashful. They know other pups in the neighborhood as well: Hershey, a spunky Yorkie; Shadow, a motherly Australian shepherd; Sage, a standard poodle; Bailey, a yellow lab; and Hunter, a red golden retriever, who tends to be surly. Early in the morning, Tebow loads up his Jet Ski with Frisbees, tennis balls, and chew treats, and cruises out to Dog Bone Island to meet up with his friends for Sunday Funday. Everyone is having a great time—until Hunter ignores the sign that warns of a rip current and begins to be swept out to sea! Can he make it safely back to shore?